Lillian F. Rex passed away January 15, 2019. 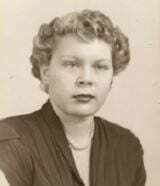 She was born August 8, 1931 in Sarah, Oklahoma to Fletcher and Ruby Halford. She moved to California at a young age and settled in Windsor where she graduated from Healdsburg High School. Soon after she met Robert E. Rex whom she married April 6, 1952. Lillian is survived by her son and three grandchildren. She was a wonderful person and will be missed greatly. A memorial service will be held at Claffey and Rota Funeral Home, 1975 Main St., on February 16, 2019 at 12:30pm. Memories and notes of sympathy may be shared at claffeyandrota.com.